Lacey Hicks joined Moore Ingram Johnson & Steele in 2018 as an associate in the firm’s Lexington, Kentucky office practicing primarily workers’ compensation defense and insurance defense. Lacey is originally from Carlisle, Kentucky. While in undergrad, Lacey worked for a regional insurance defense firm specializing in workers’ compensation defense. 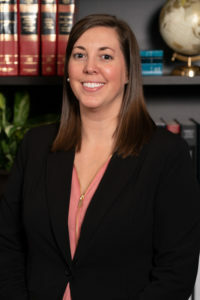 Lacey is a member of the Kentucky Bar Association, Fayette County Bar Association, and the Paris-Bourbon Chamber of Commerce Young Professionals Group. Lacey was admitted to practice law in Kentucky in 2017. Lacey and her husband, Nathan, live in Carlisle, Kentucky with their daughter. In her spare time, Lacey enjoys camping and spending time at the lake.